Less waiting: ParentEve reduces wait times for teachers and parents by finding the best appointment times. Run your first evening for free - download it today and get started! "This program is fantastic. 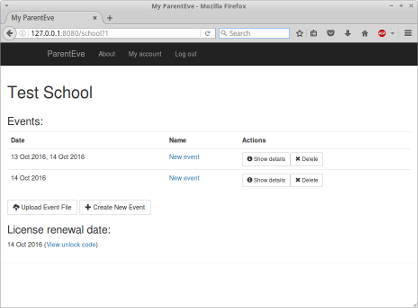 It has saved me so much time and effort planning my annual parents evening. It is simple to use even for those with basic computer skills." "I found the programme easy to use and very effective." If you book your parents evenings manually or you use a system where the parents choose the times of their appointments, your parents evenings will have a lot of unnecessary waiting time. Check your existing system; if your parents have to choose their times, you could benefit from ParentEve. With ParentEve, parents say who they want to see and when they are available, but they don't choose a time. Instead, ParentEve's powerful optimiser searches for the best times, reducing waiting times for both teachers and parents. Parents may arrive halfway through the evening, have all their appoinments within half an hour and then leave. With traditional systems, the first parents to book will get everything they wanted, but later parents will be forced to find what free times they can, often hours apart. With ParentEve, everyone gets equally fair appointments, which means there's no need for parents to rush to book. They can consider their options at leisure, increasing the value of the appointments. Experience has shown that when parents see all their appointment times clustered together, they have a better chance of attending. Similarly, lightly-loaded teachers with long wait times often don't attend an evening but arrange appointments separately - but with ParentEve, all their appointments are together and they are more likely to attend. ParentEve can import data directly from Capita's SIMS, or from other systems via CSV file export. Appointment requests can be imported via CSV exports from common parent portals such as Moodle, or it supports simple one-click manual entry of appointments. Schedules can be printed, emailed, mail merged or exported back into parent portals.